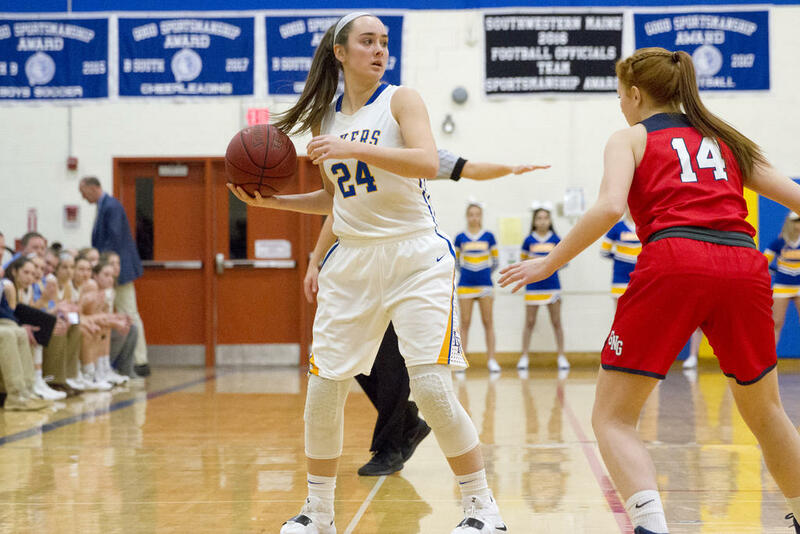 NAPLES–The Patriots started a bit slower than they did in their last win over Lake Region when they dropped in to visit those long-time rivals on Tuesday evening, Jan.15. 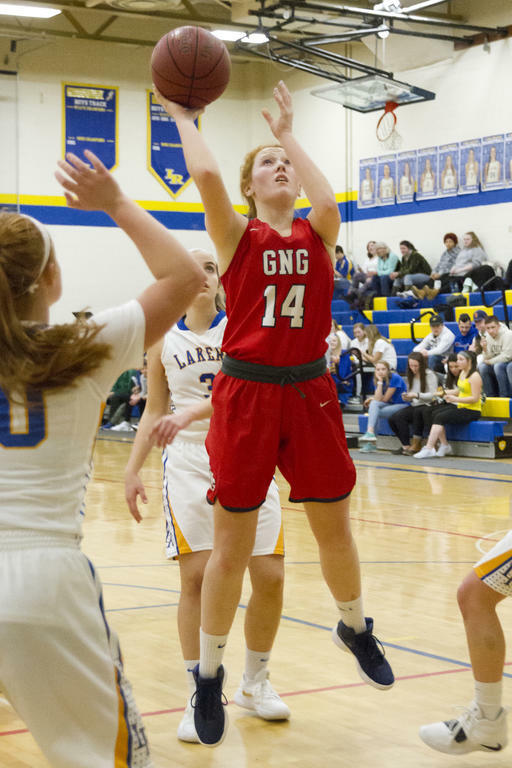 G-NG picked up steam in due course, however, dominating in the second quarter to establish thorough control of the Lakers – to the tune of 29-10 at the break. By the time the final buzzer sounded, the Patriots had assembled themselves a workmanlike – but huge – victory: 53-21 the final. 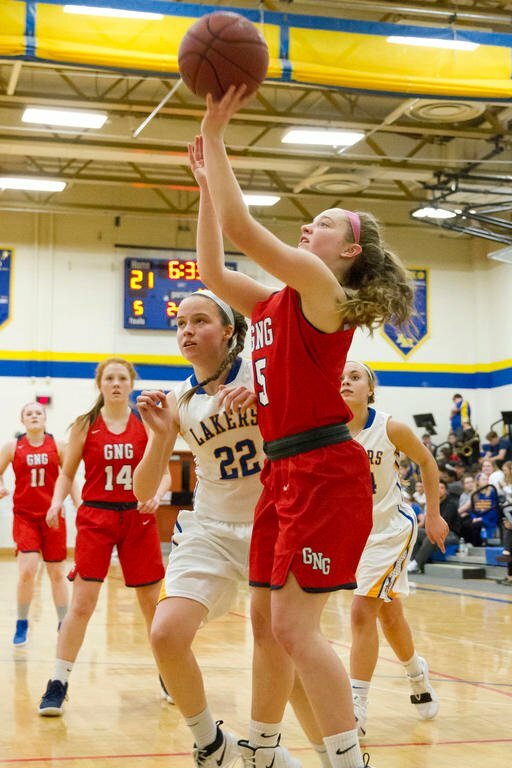 Laker Shauna Hancock led all scorers with 15; Jordan Grant spearheaded the G-NG effort with 14, while teammate Eliza Hotham added 12. “Anytime you escape Lake Region with a win, you’re okay,” Patriots head coach Mike Andreasen said. 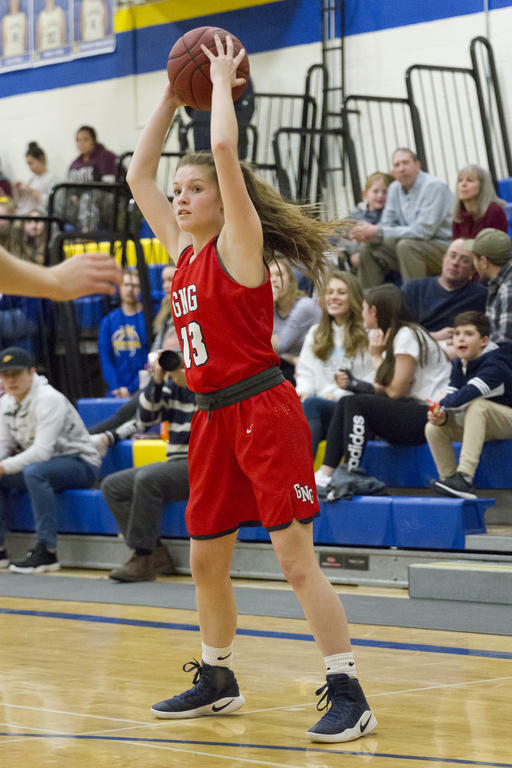 Elle Hall bucketed the game’s first two, and it took G-NG a couple clunky minutes to log their own opening point, a Mikaela Ryan free-throw. Grant then added another two for the visitors, only to see Shauna Hancock retake a 4-3 lead for the Lakers with a drive up the key. A Hotham three put the Patriots out front again, though – and this time for the last time. 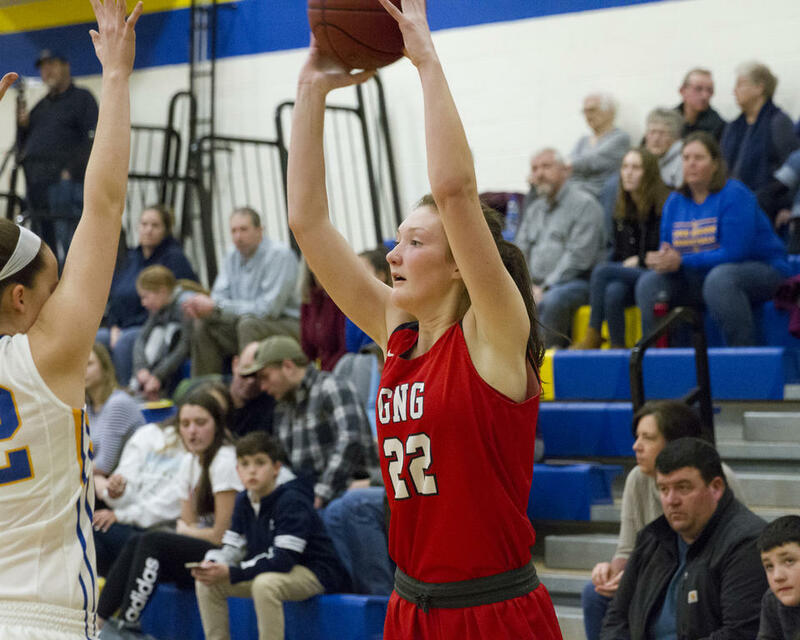 Alexa Thayer, Ryan, Hotham and Bri Jordan all contributed further points for the team before the end of the first, securing a 13-7 lead – not to mention the evening’s momentum – for G-NG. The Patriots pulled further ahead in the second, going on a 13-0 run to kick things off. Grant began the push with a steal and a two, and Madysen West followed her up with a steal and a dish – to Grant – for two more. West, Thayer, Jordan and Hotham also added points in the stretch, during which the Patriots outscored their hosts 16-3. Eleina Sturk with a two and Hancock with a free earned the Lakers’ only points. The third and the fourth proved to be more of the same. The Lakers’ take – by Hancock and Bri Sargent – came up far short of the Patriots’, by Ryan, Thayer, Hotham, Chelsea Davis, Sam Fortin and Grant, and the contest concluded at 53-21. Part of the reason for the Lakers’ struggles is simply their comparative youth, a fact of life that hobbles every program now and again. Still, LRHS has a reputation for greatness, and they’re making gains each and every day. G-NG advances to 10-1. The Patriots occupy second place in B South at the moment. The team travels to Wells (eighth, 5-3) on Saturday the 19th. Lake Region, now 4-7, is currently ranked 10th in B South. The Lakers host Poland 11th (2-9) on Friday the 18th. Mikaela Ryan ascends toward the net. Jordan Grant added double-digits for the Patriots. Bri Jordan fires off a tough shot. Abbey Michaud looks for a pass option. 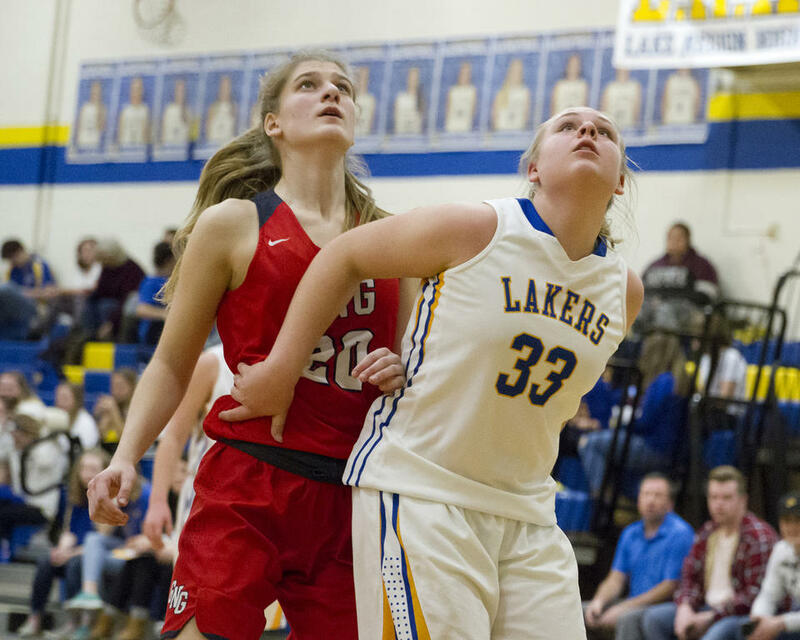 G-NG’s Sam Fortin and Lake Region’s Liz Smith go shoulder-to-shoulder following a free-throw. 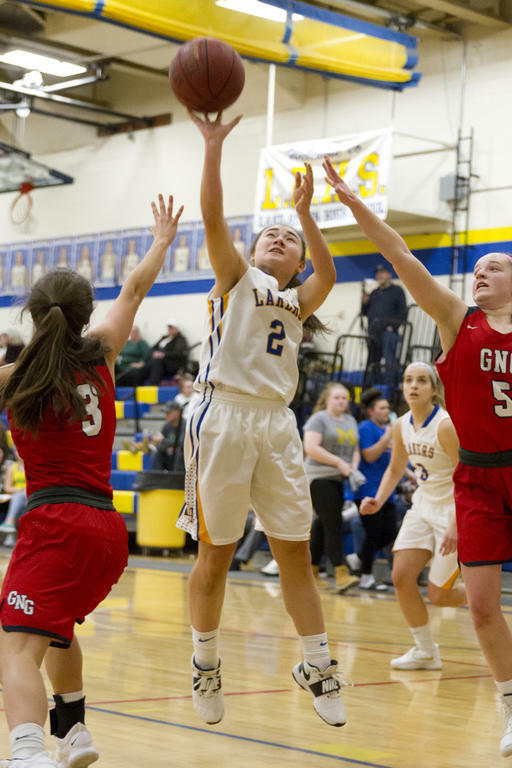 Eleina Sturk lofts up a shot for the Lakers. Shauna Hancock managed 15 for the Lakers, leading all scorers. 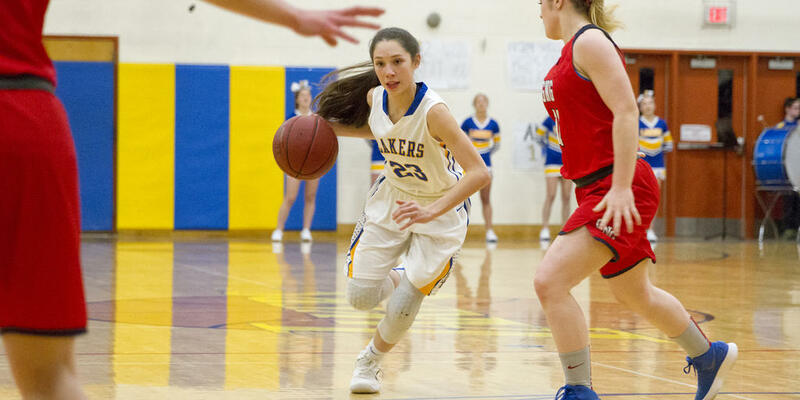 Nevaeh Stewart drives forward for the Lakers. 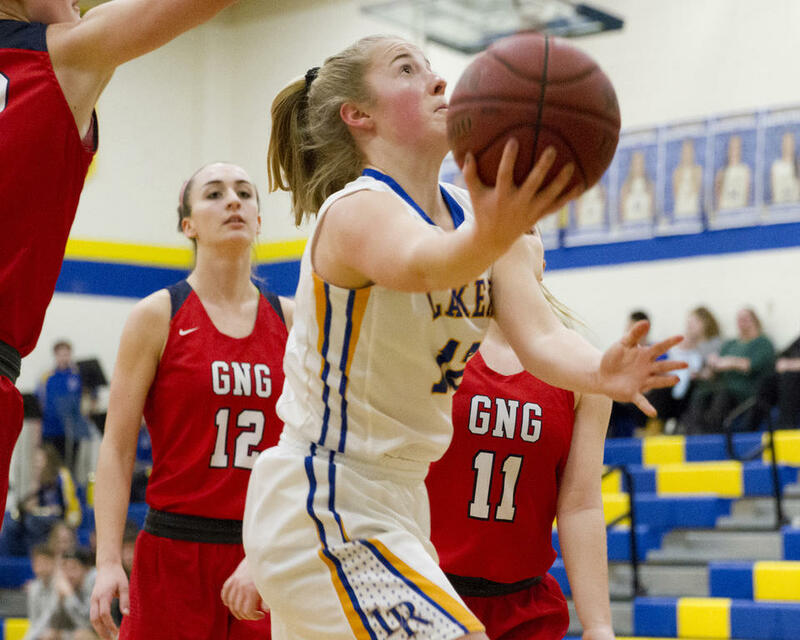 Laker Brooke Harriman surveys her pass options, under pressure on the G-NG perimeter. 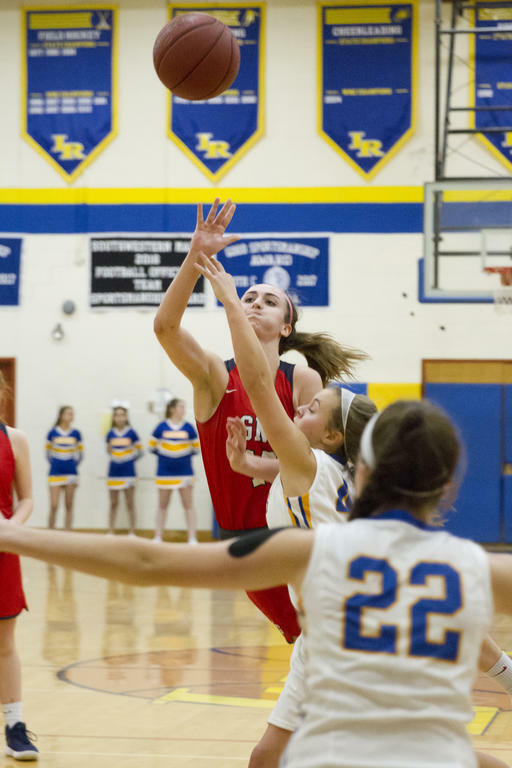 Eliza Hotham logged a double-digit evening for the Patriots in their win.